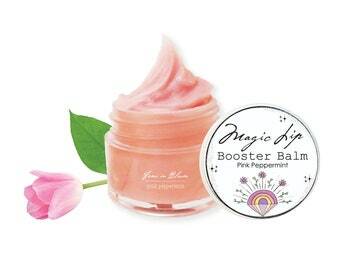 Magically treat your lips to a naturally effective three-step lip boosting treatment. 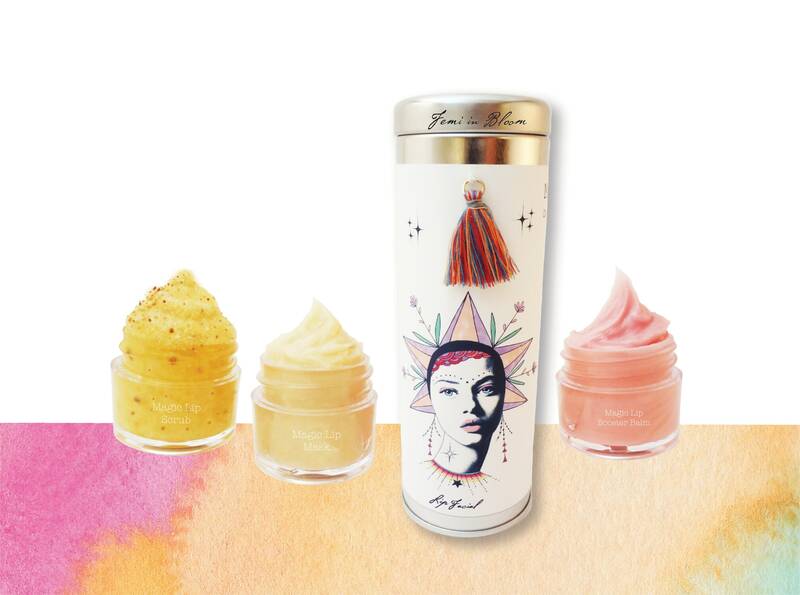 Lip polish manuka honey mint sugar mineral scrub first refines the lips, followed by a rich brightening lemon lip mask melt that deeply hydrates. 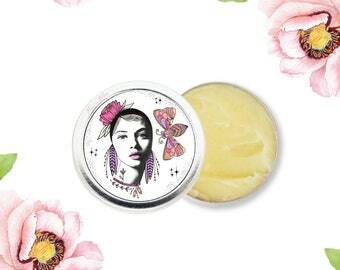 Finish with a delicious sweet peppermint bee venom manuka honey balm that stimulates lip plumping collagen. 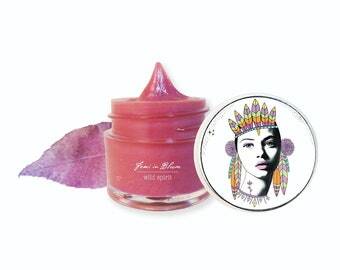 Lip Boosting Benefits: plumping, builds up collagen, combat fine lines and wrinkles, buff away dry skin, nourish dry lips, lip healing, condition and smooth, brighter lip complexion, soft lips, perfect lip pout. 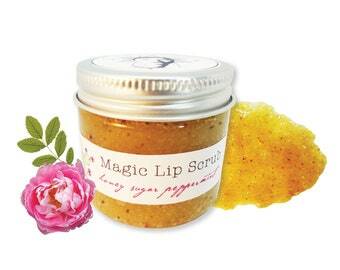 Bee Venom, Raw Manuka Honey, and Lip Loving Oils naturally deeply penetrate the lips providing the appearance of plumper, brighter, smoother, and hydrated lips with a youthful lip glow. Bee Venom helps increase blood circulation by gently plumping the lips helping to fill and smooth the appearance of fine lines and makes lips look voluptuous and youthful. 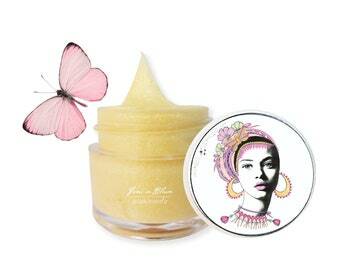 Bee Venom helps stimulate the production of collagen boosting plumping action. 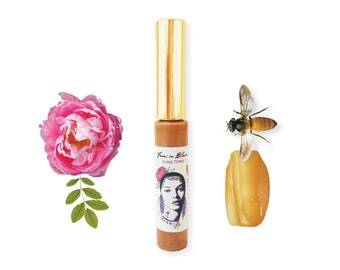 Raw Manuka Honey powers a super dose of antioxidants and nutrients to the lips. 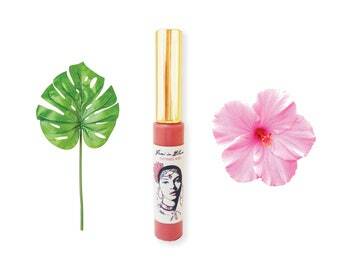 Manuka also smooths, hydrates, and brightens the lips. - Works all lip types. - Use within 1 year. - Orders come gifted in a reusable handmade bag. *All helpful Bee Venom facts listed below! *100% Natural fresh organics hand crafted in small batches, with no fillers or bad stuff used ever! Always sustainable. Gently scrub onto wet lips for about 2 minutes; then wipe off with a damp cloth. Apply a thick layer and you may leave on as it melts into your lips. It will continue to hydrate. Also the perfect nightly lip mask treatment, just apply before bed. Apply pink peppermint lip balm daily as needed. New Zealand Bee Venom is known as Natures Natural Botox. It helps stimulate the natural production of collagen and elastin, while powerful antioxidants help regenerate the skin. 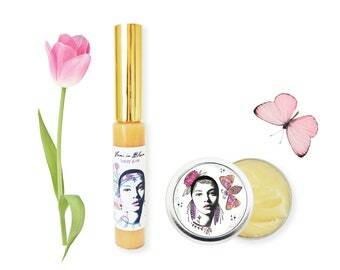 Bee Venom helps to firm and plump for smooth youthful looking lips. Harvested with the highest concentration of pollen grains to the Manuka Flower. Manuka honey comes from the nectar of the flower of the Manuka bush (Leptospermum Scoparium) which is indigenous to New Zealand. It is the sector and the bee that give this honey its unique properties. The nutrients, vitamins, amino acids and minerals in Raw Active Manuka Honey give it very special qualities. One of the most biologically active and beneficial honeys for our skin. Ideal for enhancing the skin's renewal process. Skin benefits include hydrating, moisturizing, nourishing, healing, rejuvenating, brightening, and protecting. The bee pollen found in manuka honey is extremely beneficial for health and wellness. It contains vitamins A, D, E, K, C, and the complete B-complex. Shea butter is a natural fatty oil extracted from the nuts of the karite nut, or African shea tree. 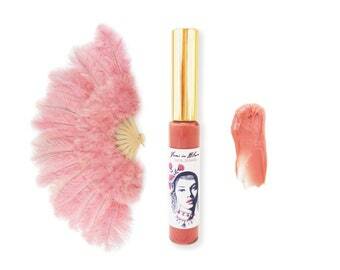 Used as a moisture barrier treatment to nourish lips so they are never dry or cracked. 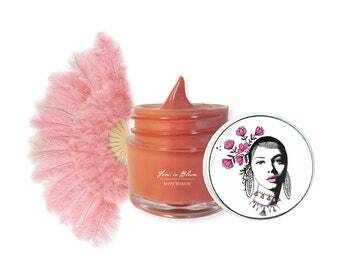 Shea butter also protects lips while acting as a daily anti-aging lip treatment. Filled with antioxidants such as vitamins E and A, which help protect the lips from free radical damage that can make them appear aged, thin, or lined. Cocoa butter contains Antioxidant Vitamins A, C, and E, offering anti-aging benefits. Keeps lips moisturized and soft. Packed with essential saturated fatty acids that encourage natural skin plumping and glow. Chia seed oil strengthens the skin cell membranes and ward off the harmful effects of free radicals. Chia seed oil helps skin hydration by locking in moisture. This oil also carries a great source of vitamin B3 and zink. Invigorating and revitalizing. 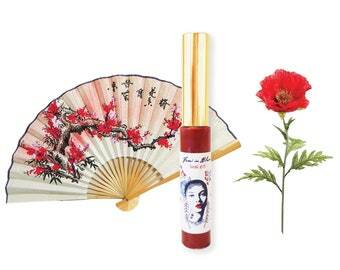 Perfect natural lip-plumping agent combo helping to bring blood flow to the lips surface. Cinnamon oil helps rebuild collagen in the lips. Harvested from the seeds of rose bushes. 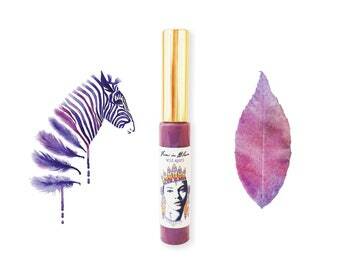 Full of antioxidents and essential fatty acids that are known to improve lips moisture and texture. Reduces fine lines and wrinkles. High in Vitamin C and Antioxidants. A wonderful hydrator and penetrates dry lips immediately. Known as liquid sunshine. Detoxifies lips. 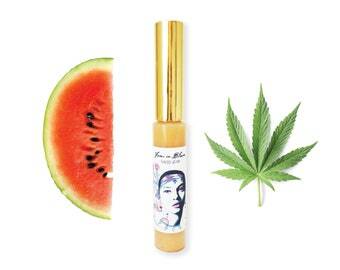 High in Antioxidants and Rich in Vitamin C. Promotes lip toning, calming, and brightening. Filled with 84 Trace Minerals. Salts from the Himalayas, some of the tallest mountains in the world! Spanning 2400 kilometers across Asia at the joining of the Indian and Eurasian tectonic plates. Within that ancient body of water existed a perfect ecosystem. As the plates of the earth moved and pushed the Himalayas more toward the heavens, the sea evaporated and all of its life-sustaining minerals crystalized under the heat of the sun to form what we call today pretty Pink Himalayan Salt. Exfoliate's and refines the lips, while benefiting from the coconuts high hydrating properties. Coconuts contain high levels of antioxidants and hydrators. Coconut sugar helps lighten and brighten the lips. Buffs away lip dryness and softly smooths the lips. Acts as a natural humectant and lip-soother, and helps prevent moisture loss while buffing away dry skin. Stevia leaves are enriched with many beneficial health ingredients such as protein, fiber, phosphorus, iron, calcium, potassium, sodium, magnesium, zinc, vitamin C, vitamin A, and chlorophyll. Used to help reduce the appearance of wrinkles and fine lines in the lips. New Zealand Raw Manuka Active Honey 22+, Bee Pollen, Active Bee Venom, Raw Beeswax, Moroccan Argan (Argania spinosa) Kernel Oil, Prunus dulcis (Sweet Almond) Oil, Simmondsia chinensis (Jojoba Seed) Oil, Prunus Armeniaca (Apricot) Kernel Oil, Carthamus tinctorius (Safflower) Oil, Persea americana (Avocado) Oil, Coconut Sugar, Cane Sugar, Fair Trade Brown Sugar Crystals, 84 Trace Mineral Himalayan Pink Salt, Raw Lemon Peel, Vanilla Bean, Stevia rebaudiana Leaf, Shea Butter, Cocoa Butter, Vegetable Emulsifying Wax, Sunflower Lecithin, Pink Rose Powder, Sunflower Vitamin E; Pure Therapeutic Grade Essential Oils, Peppermint (Mentha piperita) Essential Oil, Cinnamon Bark (Cinnamomum zeylanicum) Essential Oil. New Zealand Raw Manuka Active Honey 22+, Bee Pollen, Active Bee Venom, Raw Beeswax, Cocoa Butter, Shea Butter, Salvia hispanica (Chia) Seed Oil, Cocos nucifera (Coconut) Oil, Ricinus communis (Castor) Seed Oil, Prunus Armeniaca (Apricot) Kernel Oil, Prunus dulcis (Sweet Almond) Oil, Aloe Vera Oil, Rosa canina (Rosehip) Seed Oil, Helianthus annuus (Sunflower) Seed Oil, Simmondsia chinensis (Jojoba) Seed Oil, Vitis vinifera (Grape) Oil, Vanilla Bean Extract, Rubus idaeus (Red Raspberry), Stevia rebaudiana (Stevia) Leaf, Sunflower Vitamin E; Lemon (Citrus limon) Essential Oil, Wild Orange (Citrus sinensis) Essential Oil, Lavender (Lavandula angustifolia) Essential Oil; Pure Therapeutic Grade Essential Oils - My Lip Loving Essential Oil Elixir Blend. New Zealand Raw Manuka Active Honey 22+, Bee Pollen, Active Bee Venom, Raw Beeswax, Shea Butter, Cocoa Butter, Moroccan Argan (Argania spinosa) Kernel Oil, Prunus dulcis (Sweet Almond) Oil, Carthamus tinctorius (Safflower) Oil, Aloe Vera Oil, Simmondsia chinensis (Jojoba Seed) Oil, Rosa Rubignosa (Rosehip) Seed Oil, Ricinus Communis (Castor Seed) Oil, Stevia rebaudiana Leaf, Vanilla Bean, Rubus idaeus (Raspberry) Leaf, Sunflower Vitamin E, Pink Mica Minerals; Grapefruit Peel, Lemon Peel, Orange Peel, Ginger Root, Peppermint (Mentha piperita) Essential Oil, Cinnamon Bark (Cinnamomum zeylanicum) Essential Oil; Pure Therapeutic Grade Essential Oils - My Lip Loving Essential Oil Elixir Blend. 100% Nature Made Green Beauty Care. No Bad Stuff Ever. If you have an allergy to any of the ingredients please do not use. If you have any type of reaction contact your Doctor. As with any product you can test a small patch on your wrist first and wait a day to make sure of no allergies. Sensitivity: You may feel lip tingle and cooling from scrub and balm. BEE POWERED: Our skin care products are pure, clean, simple, and best of all, they actually work. 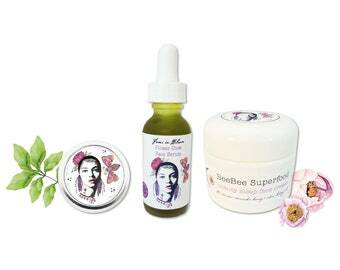 Our bee love products boost your skin the all-natural way while also providing a super dose of nutrients to keep you glowing. Urban Eco Beauty organic Bee ingredients are selected from sustainable apiaries who are full of healthy wild bees. Our purpose is to use the highest quality ingredients from the hive and that nurture a greater awareness for saving our bees. That is why all our natural skin boosting products are made with the purest of natures ingredients. The apiaries we choose and support put the bees first. They ensure the bees are healthy, pollinate in safe locations, and they never over-harvest. Leaving the bees with plenty of honey, pollen (bee protein), and propolis (the immune system of the hive) of their own. Raw honey is so high in enzymes that it’s the only food on the planet that never goes bad!! Humans have been benefiting from bees and their nourishing superfoods since the beginning of human life on earth. From Cleopatra using honey to keep her youthful glow to Hippocrates prescribing propolis to remedy everything from sores to bacterial infection. Humans have been using propolis to benefit their health since 300 B.C. In the old testament of the Bible, Israel was often referred to as "the land of milk and honey". Archeologists have since proved this to be true. Bee hives made of clay have since been discovered in Israel dating back to ancient biblical times. Our healing relationship with bee products has some serious History! The Bees are a sacred gift from God for all the earth. Even animals love their sweet fresh raw honey. The Bees pollinate and support the whole earth, and we have to learn to work along with them, not against them. The current bee situation world wide is unsustainable and we need to do everything in our power to make a difference. The lack of bees today is due to environmental stressors like pollution, pesticides, diseases, parasites, unlimited water access, and much more. The bees are fighting against a lot now and our generation is doing all we can to help bring awareness fast. Does that mean we should not use honey bee products, of course not. Using honey products is not what hurts the bees, its how we go about doing it. Using honey products that "help support the bees" is a way you can help play a part. We have to get back to working with the bees. Honey is a sacred sustainable gift for all the earth. The bees were designed in this way and they carry healing powers like no other. Bees are natures best healers. We just need to bring the ancient power of the hive into the 21st century. We have to put the bees first. ❋ How Do We Get Bee Venom? To collect bee venom beekeepers place a small electric plate outside the bee hive. When its turned on an electric current frequency gets the bees attention and they begin to get excited and start stinging it. As bees begin to sting it more follow and do the same thing. This method doesn't trap the bee stinger, like when a bee stings something living, leaving the bee free to fly away un-harmed. More venom is collected when other bees sense the chemical odors of the freshly released venom, which signals them to start stinging too. There is no harm to the bees, nor their colonies within this process. Just one bee sting alone has much power in its venom. Bees only will react in this way when they all sense they have to protect their queen. But the electric current causes no danger, however the bees protect no matter what. Its their natural reaction. ❋ How Does Bee Venom Work On Our Skin? Bee Venom is a clear odorless liquid that's released from the bee when they sting something. It consists of 20 known compounds, the most prominent being melittin, a protein that boasts powerful anti-inflammatory, anti-bacterial, and anti-viral properties. In the case of enhancing your epidermis, lip boosters and anti-aging creams use bee venom to trick the skin into thinking it's been stung. This causes the body to direct blood toward the area, stimulating the production of collagen, which strengthens tissue and elastin which helps the skin to remain taut and bounce back into shape. ❋ Is Honey or Beeswax Vegan? Most vegans do not prefer to use honey or beeswax. They prefer candelilla wax, carnauba wax, or soy wax. I personally chose *Raw Beeswax* over other waxes because I support the bees and their hives. From my research, its one of the safest most sustainable sources when done correctly and nothing is harmed at all, its 100% sustainable. As long as you know your source, which is simple to do when using sustainable apiaries and bee keepers who are helping to fight save the bees. Bees are not harmed in anyway from the bee products I use. I believe in working with the bees, and not against them. By using sustainable bee products we are actually putting money into helping the bees populate and pollinate in a sustainable thriving manner. We need them now more than ever before. I don't use "Carnauba Wax" which is found in many vegan products. It comes from Brazilian Palm Trees. I can't control where and how this wax is being harvested and almost all are not sustainable now. It's just the same as using Palm Oil. This is causing too many animals and their lands to be destroyed. I don't use Soy Wax also found in many vegan products because 93% of Soy Wax is GMO. If the soy in a product is listed as Non-Gmo its ok, however that doesn't seem to be happening in the beauty industry now due to almost all soy is GMO. When buying any soy food products make sure the label reads as Non-Gmo Soy. Soy is good for us all, but not in the manner its being processed and changed from its original natural created state. I am both the artist and crafter behind all my earth loving skin and body care products. I hand make them all in small batches and fresh to order. I designed my skin loving products simply as pure food for the skin. All orders in my shop are gift wrapped and shipped out in a hand sewn reusable bag made by me. Thank you for supporting my sustainable Bee Powered, fresh organic, handmade and naturally crafted local eco products! Please Contact Me Using Etsy Messaging Only & With Your Order Number. Thank you besties! All Etsy messages are answered within (1) business day. No need for phone calls, I have 24 hour online service, YAY! As Beegans we use local Bee Friendly product ingredients while working along with the Bees, and not against them. We support healthy Bees and healthy hives! Delivery dates are not guaranteed but estimates. Holidays, weather, and other factors may impact delivery times. USPS: All Orders shipped with a Tracking Number. *You can add insurance. International: Some countries may not be able to track directly once leaving the USA. From my US location, they leave the US from Miami, FL. If a package does not arrive as stated in your tracking please send me a message and contact your local postmaster. *We are not responsible for lost or stolen packages, but we do our very best to help you. With tracking they will know where your package is directly. Note: I don't add the shipping costs in with my actual product price listed. Shipping fees are calculated separately so you know which is which. Shipping costs depend on the weight and volume of your package, and where its being shipped to. I ship from the United States, East Coast, so if a product is going to the US West Coast, the shipping cost would be more for example. Shipping costs are calculated by USPS. I'm sorry but at this time I am unable to accept returns, exchanges, refunds, or cancellations. Please purchase seriously as all items are final sale. Once your order is placed it will begin the process to be handmade just for you. I am a family owned business offering organic natural services that take a lot of time and money to provide. Every item is handmade and made to order. My skin care is handmade fresh in small batches weekly, to remain ultimate freshness and care. In order to provide you with the best price within using local goods and the purest organic ingredients. We also use Bee safe ingredients. Therefore my small business shop must be set up in this way. Thank you for supporting local, eco, and handmade goods! Humans have been benefiting from Bees and their nourishing superfoods since the beginning of time on earth. The golden honey bee has been celebrated and blessed for its powerful healing for centuries. Raw honey is so high in enzymes that it’s the only food on the planet that never goes bad! Gods gifted creations are meant to work together and support each other within all the earth. This includes humans working with the plants, animals, and insects of the earth too. The Honey Bee is one of the most powerful resources our earth needs to remain sustainable for all. Bees have been having a tough time though due to all the pollution the earth is now fighting. As Beegans we love our Bees while working with them and not against them. If you have an allergy to any of the ingredients listed in my product description for skin/body care please do not use. If you are unsure of any allergies: Test a small patch on your wrist first. Wait 24 hours to see if you have any reactions. If you have any type of reaction to a product contact your Doctor. Anyone with Bee Allergies, please ask your doctor prior to using products containing Bee Venom/Honey. Urban Eco Beauty is not responsible for any type of skin reactions. If you find you cant use the product, please gift it to someone who happily can. DISCLAIMER: Our products and statements have not been evaluated by the Food and Drug Administration (FDA) and are not intended to diagnose, treat, cure, or prevent any disease.